Cuthbert Brodrick FRIBA (1 December 1821 – 2 March 1905) was a British architect, whose most famous building is Leeds Town Hall. Brodrick was born in the Yorkshire port of Hull where his father was a well-to-do merchant and shipowner. He was the sixth son of ten children of John and Hannah Brodrick. The family lived at 39 George Street in the best residential area of Hull. Brodrick attended Kingston College in Hull and, on leaving school, he became an articled pupil in the architectural practice of Henry Francis Lockwood whose premises were at 8 Dock Street. Brodrick remained at Lockwoods from 1837 until May 1844 when he embarked on the Grand Tour to continue his studies. He travelled through France to Rome in Italy. Whilst on the tour, he studied Second Empire architecture in Paris; it influenced his later designs. When Brodrick returned to Hull in 1846, he was offered a partnership in Lockwood’s firm. He refused this, and set up in practice on his own at 1, Savile Street in Hull. He designed a number of local buildings in Hull including the Hull Royal Institution building and the Hull Town Hall. 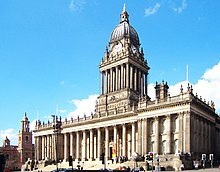 In 1852, aged 29, Brodrick entered and won a competition for the design of Leeds Town Hall. The competition was judged by Charles Barry. The town hall was opened in September 1858 by Queen Victoria. Brodrick moved to an office at 30 Park Row, Leeds and acquired the nickname 'Town Hall, Leeds'. The iconic clock tower, which serves as a symbol of Leeds, was not part of Brodrick's initial design but was added when the civic leaders sought an even grander architectural statement. His other important buildings in Leeds were the Leeds Corn Exchange (1860-3) and the Mechanics' Institute (1860-5) which became the Civic Theatre and in September 2008 the home of the Leeds City Museum. He altered the way central Leeds looked with just three buildings. His only church was Headingley Congregational Church on Headingley Lane. He submitted unsuccessful designs in competitions to build Preston Town Hall, and the Exchange in Manchester. A Wetherspoons public house, the 'Cuthbert Brodrick', opened on 22 October 2007 on Millennium Square in Leeds opposite one of the buildings he designed (the Leeds City Museum) and not far from another (Leeds Town Hall). It is near the site on Cookridge Street of the Oriental Baths which he also designed; they were built in 1866 and demolished in 1969. His nephew was F. S. Brodrick, also an architect worked with R. G. Smith. Brodrick was the subject of a 2007 BBC2 television programme The Case of the Disappearing Architect by Jonathan Meades. ^ "BBC - Leeds - How We Built Britain - Cuthbert Broderick". www.bbc.co.uk. Retrieved 24 August 2009. ^ Wrathmell, Susan (2005). Pevsner Architectural Guides: Leeds. Yale University Press. p. 257. ISBN 0-300-10736-6. ^ Historic England. "Number 44A with entrance steps, Headingley Lane (1255982)". National Heritage List for England. Retrieved 16 July 2018. ^ "The Building – the bricks & mortar". City Church Leeds. Retrieved 4 October 2010. ^ "BBC - Legacies - Architectural Heritage - England - Leeds - A bolt out of the blue - Article Page 1". www.bbc.co.uk. Retrieved 24 August 2009. ^ Grand Hotels: Reality and Illusion - Google Books. books.google.co.uk. Retrieved 24 August 2009. ^ "Ancestry.co.uk - 1901 Channel Islands Census". search.ancestry.co.uk. Retrieved 25 August 2009. ^ Directory of British Architects 1834 ... - Google Books. books.google.co.uk. Retrieved 24 August 2009. ^ "The Cuthbert Brodrick, Leeds - Leeds City Guide - The Essential Guide to Bars, Pubs, Clubs, Hotels and Restaurants in Leeds". www.leeds-city-guide.com. Retrieved 25 August 2009. ^ Leach, Peter; Pevsner, Nikolaus (2009). Yorkshire West Riding: Leeds, Bradford and the North. New Haven and London: Yale University Press. p. 448. ISBN 978-0-300-12665-5. ^ "The Case of the Disappearing Architect". BBC 2. Retrieved 29 August 2011. Linstrum, Derek (1999). Towers and Colonnades: The Architecture of Cuthbert Brodrick. The Leeds Philosophical and Literary Society. ISBN 1870737113. This page was last edited on 24 March 2019, at 01:03 (UTC).